O'Sheas, Flamingo, Bills Gamblin' Hall, Bally's, Paris and Planet Hollywood. Caesar's Entertainment properties now cover about 350 acres of prime Las Vegas land which includes; Caesars Palace, Harrah's, Imperial Palace, O'Sheas, Flamingo, Barbary Coast, Whole-in-the-Wall Restaurant and Plaza, several small (and soon to be vacant) apartment buildings, Bally's, Paris, Planet Hollywood, Rio and a large parcel behind Planet Hollywood. In what seems like an attempt to catch up with MGM,	Harrah's now owns eight Strip (and one near-Strip) properties. Since they also own all the land behind Planet Hollywood, they are well poised for future expansion. NEWS 7/16/09 Harrah's Giant Wheel - Lucky Seven? Will the seventh proposed location for a giant observation wheel be lucky seven? Maybe. As most of you already know, there have been six failed locations for a giant wheel in Las Vegas. These are from two wheel-dealers, Voyager and The Great Wheel Corp. Voyager's concepts all have a large structure encasing the hub. This structure houses nightclubs and restaurants. The Great Wheel Corp's designs have simple hub designs. So, based on the rendering, it looks like Harrah's is working with The Great Wheel Corp on this project. The project calls for the abandonment of the access road the separates the Flamingo and O'Sheas. That street will become an outdoor promenade lined with multi-storied clubs and restaurants which lead to the wheel at the end (near the monorail crossing). This causes another issue; pedestrians won't be able to see the wheel from many vantage points with all the tall strip-close buildings in the way. All of this is pending financing which is pretty much a joke right now. The big-box building in front of Imperial Palace gets to be a billboard (that building houses IP's sports book, and the world's worst buffet - yuk). Structures are added to the Flamingo side of the promenade. Structures are removed from the IP side of the promenade. People are crossing Las Vegas Blvd as speed-blurry cars whiz by. So, if they implode the parking structure, and what we're seeing is a new building, where will 2/3 of Flamingo's customers park? How do you all feel about the de-themeing of IP's frontage? Harrah's Entertainment Inc. will soon change its name to Caesars Entertainment Inc (CE). This will be the second time that name has surfaced. When Park Place acquired Caesars in 2004, they changed their company name to Caesars Entertainment (taking advantage of the high-end name). 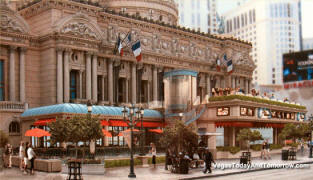 Back then, CE owned Caesars Palace, Bally's, Paris and Rio. No timeframe was given for the name change. The $17.7-billion buyout of Harrah's Entertainment is final. Harrah's will no longer be listed on the New York Stock Exchange. Apollo Management and TPG Capital have completed the task of taking Harrah's private. The new owners have stated that they are still going forward with major (yet to be announced) plans for developments and expansions in Las Vegas. 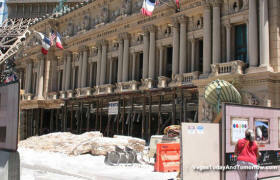 NEWS 8/22/07 Will Harrah's Build an Arena ? Harrah's and AEG released plans to build a $500-million, 20,000-seat arena on ten acres of the unused land behind Bally's and Paris. The arena will be a state-of-the-art, high-end facility capable of housing an NBA or NHL franchise. The project is expected to break ground in the summer of 2008 with an opening planned for 2010. AEG is a leading developer and operator of venues such as STAPLES Center, The Home Depot Center, Target Center, London's O2 Arena and NOKIA Theatre in Times Square. There was no mention of the vehicular traffic impact such a project will create, this might be a big issue for an arena of this size in such a busy area. Harrah's Entertainment, Inc. will announce the next step in the company's Las Vegas Master Plan. Following on the heels of last month's $1 billion+ Caesars Palace expansion announcement, Harrah's will unveil development plans for a new entertainment offering. The Barbary Coast has officially converted to Bill's Gamblin' Hall & Saloon. To the naked eye, not much has changed, however (to this reporters eagle eye) the place has changed for the better. Harrah's has replaced the ratty carpet in the casino, used gallons of Windex and brass polish on the crystal chandeliers and buckets of Liquid Gold on the woodwork. The place seems so fresh and clean, it's a pleasure to play there now. Harrah's is converting the players club to Harrah's Rewards, which will tie all the Harrah's properties together. Barbary Coast's new name will be Bill's Gamblin' Hall & Saloon, named after company founder Bill Harrah. The Nevada Gaming Control Board has recommended approval of the land swap (outlined below), which still has to get an approval from the Nevada Gaming Commission. They need to change the name because Boyd has the rights to the Coast name (South Coast became South Point when Boyd sold it). I doubt they throw much money at the property and that it will eventually be imploded so they can realize their master plan. I figure Bill's will be short-lived. IP will be the first to go and Harrah's Resort will expand into that area. Bally's will become a Horseshoe. 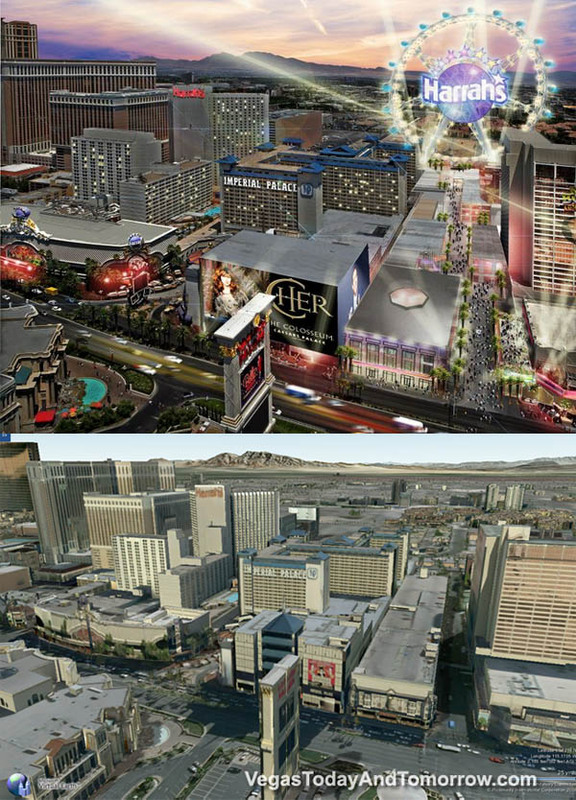 The older "T" shaped tower will be imploded while the newer tower (nearest to the strip) will be saved and re-skinned. The front yard (now a waste of space) will be developed as a new casino, bringing it right to the strip. I can foresee (now that they have the Barbary Coast land) an Expansion of the Flamingo to the corner with a second floor retail and restaurant corridor, bridging Flamingo Road and merging with the new Horseshoe development. The neighborhood behind Harrah's/IP/Flamingo, will be used for convention space, parking and possible residential towers. Nothing was stated about the land behind Paris and Aladdin. 10/02/06 Harrah's Entertainment and Boyd Gaming finally agreed on the trade of the former Westward Ho and adjacent property for the Barbary Coast. 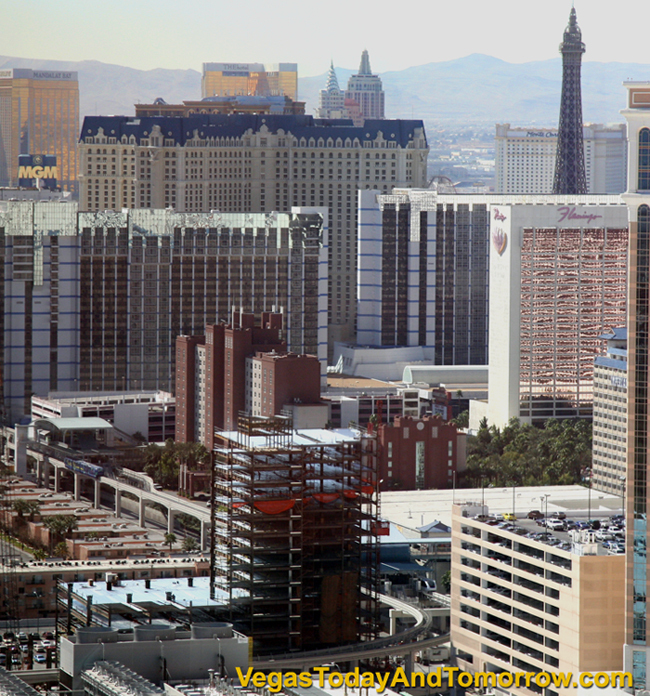 In the real world, trading a 4.3-acre lot for a 24-acre lot (on the strip, 1.5 miles away), doesn't seem like a good deal, but Vegas is not the real world. This agreement will be consummated in the first quarter on 2007. It gives Boyd 24 acres which are adjacent to the 63-acre Stardust and Budget Suites sites (that are being redeveloped into the $4-billion Echelon Place) for a whopping 87 contiguous acres. According to an undisclosed official at Boyd Gaming, the plans for Echelon Place will not be altered by the newly acquired property. That property will be developed as Phase II, after Echelon Place is completed. The land will be used for staging during the construction of Echelon Place. 7/30/06 Harrah's has a new angle on procuring the much-coveted Barbary Coast. Harrah's now has options on the Westward Ho property which they are using as a bargaining piece. If they take the bait, Boyd (the owners of the Barbary Coast) would be able to expand their Echelon Place plans onto the adjacent Westward Ho land. This acquisition would give Boyd 87 contiguous acres. This seems like a good deal for both parties. The map (above) illustrates the size difference between the Westward Ho's 24 acres and the Barbary Coast's 4.3 and the proximity of these properties to their wanting neighbors. If Boyd doesn't take the deal, Harrah's options with the Ho could also be played to MGM MIRAGE which owns Circus Circus (which is adjacent to the north edge of the HO land), or, Harrah's could choose to build on the land. 3/01/06 Since the last report, Harrah's has purchased a 19.5-acre apartment complex on the east side of Koval (north of Flamingo). 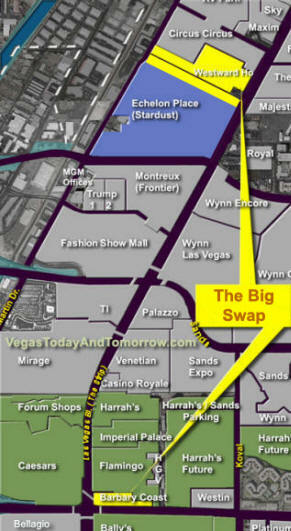 Harrah's has also purchased a few more parcels in the hodge-podge neighborhood behind the Flamingo and IP. This will give Harrah's over 120 contiguous acres north of Flamingo Blvd (once the rest of the apartments are snatched up). OK, here's where things get interesting. The Barbary Coast sits right in the middle of Harrah's properties, blocking the possibility of Harrah's linking the Flamingo with Bally's. Boyd (owners of several properties scattered throughout the Las Vegas valley) owns the Barbary Coast hotel and claims to not be interested in selling it to Harrah's or anyone else. Harrah's then started buying land behind the Flamingo. The purchases include; the Hole-in-the-wall restaurant and plaza, Bourbon Street (now imploded), several small apartment buildings and the new 19.5 acres, giving them a place to bridge across Flamingo Road to Bally's. 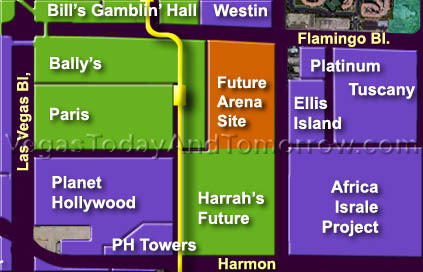 Harrah's also owns about 35 acres behind Bally's, Paris and Planet Hollywood (Aladdin) which gives them frontage on the Harmon Corridor. As Harmon becomes more developed, I'm sure this parcel will become a bigger priority for Harrah's. That would give them a large entrance to the empire between the new Planet Hollywood timeshare and the W Hotel. 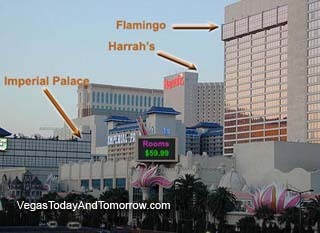 My Guess is; they will blow up the Imperial Palace and most of Harrah's, after they remodel the Flamingo. They will eventually purchase all of the neighborhood behind the IP and Flamingo and use it for convention and condo space. 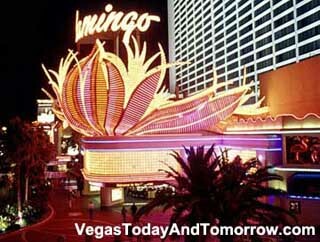 They'll build a new Strip resort, and tie it in with the revamped Flamingo. 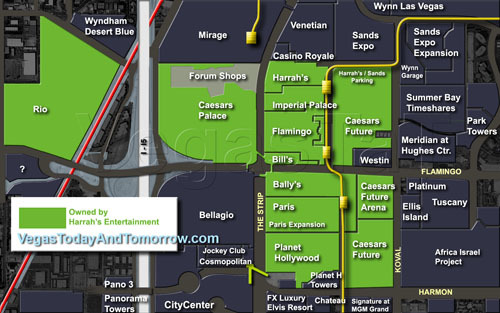 They will expand the Flamingo to the corner (assuming the Barbary Coast swap deal goes through), and could easily build over Flamingo road to Bally's with restaurants and a night club with a Bellagio fountain view. A boutique hotel would fit nicely in the old Bourbon Street site. They could also build a new resort on Harmon Ave. and tie it into the backside of Paris and Bally's which would hi-jack Harmon pedestrians into Harrah's connected empire. The Flamingo has slowly started a makeover which will cover most of the (well used) public spaces including guest rooms, the casino, bars restaurants, retail areas and the lobby. Evidence can be seen on the third floor of the parking garage near the pedestrian bridge where a painted concrete planter is receiving a new polished granite skin. Harrah's must have something up their sleeve. 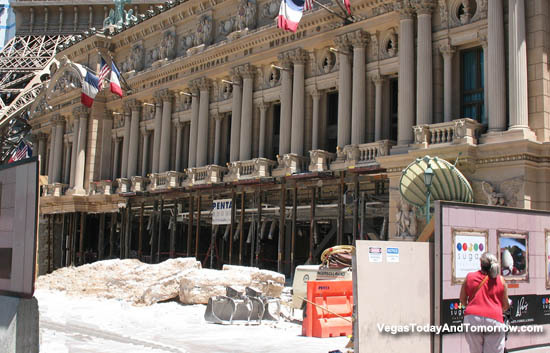 The talk about Harrah's eventually imploding the Flamingo are not necessarily wrong. It makes sense to keep at least one of your profit centers open while the construction-years of a major project drone on. Maybe the demise of the Flamingo will be the last phase of this project 4-5 years down the road. Meanwhile, the old girl is looking her age, so a modest investment will keep the Flamingo fans happy and make new friends as well. Just a guess. 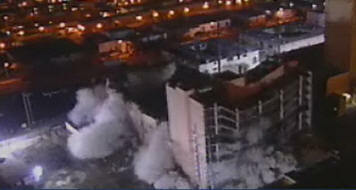 Harrah's announced that the Imperial Palace and O'Sheas will indeed be imploded. They also hinted at major reconstruction and or demolition of part or all of their Flamingo and Harrah's resorts adjacent to the Imperial Palace. Harrah's planners are working on a conceptual development. "We're going to put in place assets serving guests well into the next decade, so the problem is what range of entertainment offerings should be present in that location not just in 2005, but in 2012 and 2015." 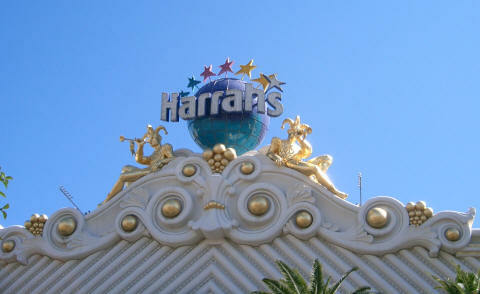 Harrah's Entertainment Monday, announced the purchase of the Imperial Palace for $370 million. Seems like a lot for a downtrodden hotel but the land underneath the hotel is what Harrah's really wants. Located between Harrah's Las Vegas and the Flamingo on the east side of the Strip and across the street from Caesars Palace, the 2,640-room Imperial Palace sits on 18.5 prime acres. This land will allow Harrah's to eventually link Harrah's with the Flamingo by Imploding the IP and expanding either Harrah's or the Flamingo or both. Linking commonly owned hotels via inside malls and walkways has been a trend in Vegas since the Excalibur linked with the Luxor. This keeps the customer from wandering into enemy territory. In this never ending Monopoly game, Boyd made a strategic move and purchased the 1.8 acres of land under its Barbary Coast hotel. Boyd already owned the Hotel and the 2.5 acres behind it (which is used as a surface parking lot). This gives Boyd full leverage for the Barbary Coast's future. The 1.8 acre parcel sold for the bargain price of $15.7 million (that's $8.7 million per acre compared to the $20 million per acre Harrah's paid for the Imperial Palace). Now they can either develop it or sell it to Harrah's for a profit. Even with the huge underground parking garage being built under the Palazzo, Sheldon Adelson (the owner of the Venetian and Sands Expo) is still coming up short in the parking category. Arrangements have been made with Harrah's. Harrah's will allow Adelson to build a parking garage on their property (see map below) if Adelson lets Harrah's have the first few floors of it for their use. Adelson will use the upper floors for much needed employee parking. It will be linked by bridges to the existing Venetian parking garage. 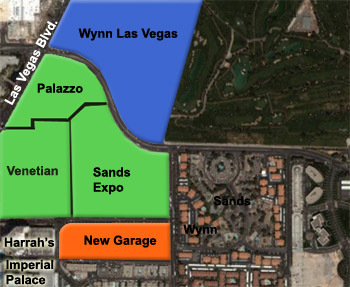 This may let Adelson use his newly acquired property (behind Sands Expo) for other purposes. Construction has started on the new garage and until it's completed, the employees of the Venetian and Sands Expo are parking at a lot behind Paris (leased from Harrah's) and shuttled to work. 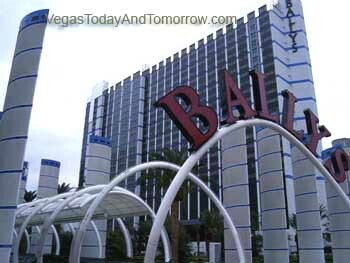 Bally's, (which opened as the MGM Grand in the 1970s) on the Las Vegas Strip at Flamingo Boulevard, may be renovated and renamed to woo visitors attracted to newer resorts. No formal plans or renderings are yet available although there is a rumor that Bally's may be imploded. 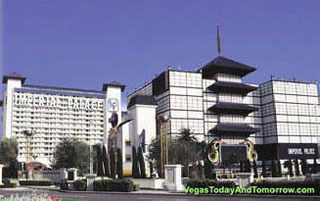 Harrah's acquired Bally's Las Vegas in June 2005 with its $6.5-billion purchase of Caesars Entertainment Inc. 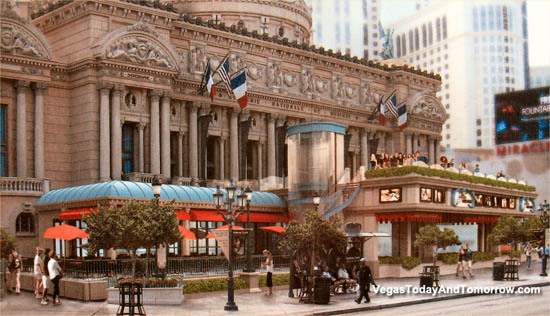 This purchase will add Caesars Palace, The Flamingo, Paris and Bally's to Harrah's inventory. Since Harrah's dumped their other Bally's property and acquired the Horseshoe brand last year, I suspect the Horseshoe brand will be used on whatever becomes of this property.